Summary: This new signal service promises returns up to 86% on multiple expiry times. I'll let you know if it's ready for prime time. 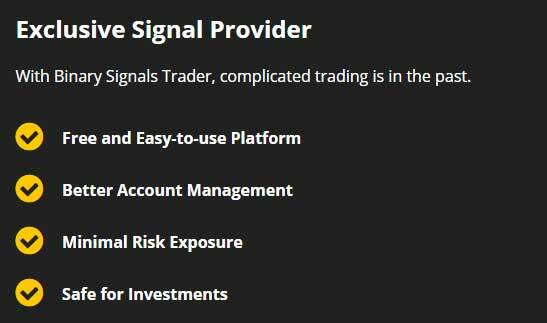 Today I’m looking at a new binary options signal service brought to us by Simon Russell, Binary Signals Trader. While the service originally advertises itself as a signal provider, they do utilize a trading software to analyze “current financial market fluctuation so traders can receive signals in real time.” This means that the software is determining trade opportunities, and not Simon Russell directly. Display multiple searches on Google, there doesn’t seem to be any record of a Simon Russell in the binary options market. In fact, the image that is used for Russell is clearly a stock image, as it’s been used many times 4 different products and websites throughout the Internet. Using a stock photo isn’t a major deterrent for me, but it does bring attention to the fact that we do not know who is behind the system, and that’s not a good sign. To contact the support team, and to potentially find out who is behind this system, you can email [email protected]. Want highly rated trading systems, see the best binary options software here. We’ve already come to the conclusion that the Binary Signals Trader developer Simon Russell doesn’t exist. So, let’s try and compartmentalize that information and analyze some of the other information we are being provided. With this service, the creators want the community to know that it is an easy-to-use platform, that they provide great account management, minimal risk exposure and that this is safe for investments. They also want us to know that they have a win ratio up to 86%, that they provide real-time binary alerts, and this is the best choice for beginners because of how simple the platform is to use. The more time I spend on the website, the more I sense that this is another automated trading platform connected with binary options brokers. In my long history in this market, I’ve found that automated binary options software has been a useless endeavor. There has yet to be a fully automated software in this market that has been able to win consistently. Each automated solution can generally win for 1 to 2 weeks before totally destroying the account. Hopefully that isn’t the case this time, but I’m certainly skeptical. In terms of strategy, the developers tell us that the Binary Signals Trader takes advantage of correlation and high-frequency trading. Sadly, this is all they tell us, which makes me wonder if they actually understand the concepts, or if they are just spouting them off to sound like they do. The main issue I have with the Binary Signals Trader service is the lack of trading results. Despite multiple occasions on the sales page where they mention that they have an 86% win ratio, they don’t provide us with a single trade. The only way a developer can come up with a number like 86%, is if they have actually done some testing. So, if this developer has done adequate testing, then they should be able to provide us with those tests, so we can see how they have come up with this number. In this case, we are not provided with any proof which leads me to believe that the developers of this system are fabricating this number. Whenever they mention the 86%, they always preface it with up to 86%. So maybe they actually provide a 10% win ratio, with the ability of that going up to 86%. If this is the case, that would be useless. I really don’t see any reason that is compelling us to sign up with the binary signals Trader today. Without providing us with any proof or verified results, I don’t see why I would choose this service over another. Sure, the website looks slick and professional but Simon Russell doesn’t exist, and they don’t give us access to trading results or trading strategy. With those being the 2 most important elements, the creators of this system need to do much more before we can consider this a real opportunity. Thank you for visiting, and please let me know what you think by leaving a comment or question below.